Hi! My name is Rick Cobb. I am the author of okeducationtruths. In this post, I’m going to write about myself. You have no idea how uncomfortable that makes me. For the most part, I won’t resort to humorous images, classic rock, or references to Shawshank. I’ll just try to be as real as possible. My first teaching job was in Muskogee in 1993. As my winding career path has led me to the position of Assistant Superintendent of Curriculum and Instruction in Moore, I had only ever worked under one state superintendent – Sandy Garrett – until 2011. During Janet Barresi’s campaign against Sen. Susan Paddack in 2010, she had said several caustic things about teachers and about schools, but you never really know how campaigning will translate to leading. I voted for Paddack, but I was willing to give Barresi a chance. Elections have consequences, after all. Then that crazy first State Board of Education meeting happened. Barresi wanted her own people, and she didn’t care how they were paid. She fired many great educators with a long history of helping schools help kids. I resigned myself to waiting out her four-year term in silence. Obviously that didn’t last. Below, I attempt to capture the journey that led to me being an outspoken blogger, and eventually more vocal in real life. Three events during Barresi’s first 15 months really accelerated my frustration. Serving on the ESEA waiver committee – In the fall of 2011, I was invited to serve on one of three subcommittees at the SDE to help draft Oklahoma’s waiver request. By the first break, many of us had come to realize that we were just there as window dressing. The essence of the waiver had already been written, with greater input from Jeb Bush’s Foundation for Excellence than any of us. Nobody to listen to the A-F public comments – In March of 2012, when the rules for the A-F Report Cards were still in draft form, the SDE held a forum for public comments. Apparently, attending this forum was not a priority for Barresi, her top staff, or the state board members. Observations about the reward schools – The next month, I had the privilege of attending a ceremony at the SDE to receive certificates for the schools in my district that were deemed Reward Schools by the SDE. We have more than 30 campuses in Moore. Of these, 17 have a Title I program. Eight of our nine Reward Schools were not. While all of these schools have staff that work hard, so do our schools that didn’t make the list. I inquired about the criteria, but I couldn’t get any answers. I got a complete list of the schools, though, and I started doing some research. There was a strong correlation to free/reduced lunch percentages. The system artificially creates winners and losers. In the process, it demeans both groups. We have a lot to be proud of in Moore – more than just those nine schools. I wish I could find the picture of Barresi, SBE member Baxter, and me posing with those nine certificates. It would have been a great image to include here. After the SBE meeting in which he called for her resignation and she called him a name, that picture immediately popped into my head. Unfortunately, it was probably lost in one of the moves our Administrative Service Center has had to make in the last couple of years. No, I never framed it. Why did I write anonymously? Fourth Generation Teacher, Claudia Swisher, is a long-time family friend. Her son and I graduated from high school together. She drove our basketball carpool in middle school. After the Reward School ceremony, I put some numbers and language together and sent her an unsolicited guest post for her blog. I emailed her the draft of my first blog post on April 17, 2012. We tried, but we couldn’t make it work with all the tables I had made. After some consideration, I started okeducationtruths eight days later. I didn’t want to put my name to the blog for several reasons. I didn’t want the attention on me or my school district. I didn’t want the principals, teachers, parents, and students in Moore to think that I didn’t appreciate the schools that were rewarded. My point, which I was afraid might get lost, was that we have great schools NOT being rewarded – including two Title I schools that had recently been named Blue Ribbon Schools by the USDE. I don’t know how I came up with the title, or the motto, when the record on public education in Oklahoma needs to be set straight. I guess they’ve worked pretty well, though. As the number of readers grew, I did occasionally receive interview requests and invitations to speak at events. I seriously considered these. However, I decided that what made this blog work was the ideas – not the personality. I’ve had many people send me information that has helped me shed light on public education issues that otherwise would not receive attention. I can’t count them, and I’ll never name them. Their anonymity is just as valuable as mine has been. Other than Claudia, my wife was the only person I told right from the beginning. My only promise to her, as far as the blog was concerned, was that I would never publish anything using Comic Sans. Until the last few months, I hadn’t even told anybody in Moore. Until the last few days, I hadn’t even told my mom, who was a 29 year special education teacher. Over the last three years, a few people have figured it out, either through mistakes I’ve made (like tweeting from the wrong account), or just similarities between things I say publicly and the content of this blog. I’ve even had people let me know they had figured it out but that they wouldn’t tell. I assume more people know than I realize. The discretion of those in the know has impressed me. I’m grateful beyond words. In early June, I saw Rob in Norman at a conference and made the gesture and introduced myself. Until then, he didn’t know who I was. He told me he had suspected, based on some of my comments under my real life Twitter handle (@grendelrick). Since then, we have shared a number of ideas. Did I ever consider quitting? There have been a number of times I wanted to quit. One of the biggest reasons is time. Almost all of the countdown from last June (20 reasons to vote for anyone other than Barresi) was written over coffee and cereal. I find writing both cathartic and exhausting. After June, I was exhausted. That’s part of the reason I haven’t written as frequently since then. From the beginning, I never planned on being a blogger. I wanted to write one piece, present it as something of a white paper to Claudia for her blog, and go back to my under-the-radar life. I was in the middle of writing my dissertation, and I needed to focus on that. I did find that writing the blog helped me get into a zone and finish my dissertation, though. So that was a nice thing. I successfully defended in March 2013 and figured I would write more. Two months later, everything changed. Those who personally know me understand why I don’t like to talk about the tornado. For a while after the storm, I figured the blog really didn’t matter. Eventually, it was one of the things that helped me heal. I have rarely mentioned the storm or our district’s recovery on okeducationtruths because I don’t feel like that’s my story to tell. It’s a shared experience among all of us who’ve been through it. I decided this really wasn’t the place to open a window into the district. The next month, when Barresi sent every Moore Public Schools employee an email – a really badly written email – explaining state aid, I decided not to write about it. Then I received several copies of it in my blog email account. I decided I should share it. Then last June, when Barresi compared recovering from the tornado to the state losing CCSS, I lost it. Rob let me know he’d be writing about it, which gave me some time to calm down before I started. When our superintendent, Dr. Robert Romines, commented on Rob’s blog, I was proud of both of them. I don’t speak for the district, especially when it comes to the tornado. There have been many times I just haven’t felt like blogging. I’m like each of you with jobs and families. Sometimes, other things are more important than what I do Because of this, I’ve probably missed a few news cycles. When I do, it’s really no big deal. There are always other bloggers out there to catch things I miss. When I take little breaks, I miss it for a few days, then not at all. So far, something has always brought me back. Has blogging interfered with my job? No, it hasn’t. Barresi’s SDE has interfered with my job, but blogging has not. If anything, it has helped me do my job better by broadening my professional learning network. As Assistant Superintendent for Curriculum and Instruction in Moore, I wear many hats. I supervise a talented group of curriculum specialists. I serve on the district’s Professional Development Committee. I directly manage the Title II program and indirectly supervise the Title I program. With so many responsibilities that were new to me when I came to the district in 2008, I came to find value in several groups that met at the SDE. One of these was the School Improvement Advisory Council. For years, the SDE had hosted SIAC once a month. Most who attended were in similar positions in other districts around the state. Individuals from higher education and career tech also attended. We discussed initiatives in our own district and legislative/policy issues. At some point during Barresi’s first year, those meetings stopped. A group of nearby schools formed the Metro Teaching and Learning (MT&L) consortium in its place. This is still the group I call when I have questions or ideas that need vetting. In fact, this group gave me much of the language I needed when I wrote about A-F, RSA, and countless other issues. On occasion, they would even wonder openly about the identity of okeducationtruths. I didn’t know whether to feel proud or uncomfortable. Honestly, given the early content, it could’ve been any of us. Early on, I decided that if I said something at work, I wouldn’t use it on the blog. I might write about the same issue, but I wouldn’t use the same language. My commitment to the people who pay my salary is greater than my commitment to blogging. This stance changed last June. Principals and teachers in our district were upset about the irregularities with the state writing tests. We had too many examples where we disagreed with the score to just sit idly by. The MT&L consortium had an impromptu meeting at the CCOSA conference, and we decided somebody should speak at the next State Board of Education meeting. My superintendent was fine with me speaking, so I did. Below is a picture of me addressing the SBE two days after Hofmeister won the primary. What I said that day was the same message I had on the blog. It was the same thing I was saying to the people at work. I trust our students and teachers more than I trust the testing company. In August, when the SDE threw out the writing tests, it was for reasons similar to what I had said in front of the SBE in June. Much of the language came from the MT&L consortium. More came from people in Moore. Some even came from stories my readers were sending me and details posted to other blogs. It showed me how interconnected we all really are. What are some other awkward moments I have had as a blogger? One of the first worlds colliding moments I ever had was when a co-worker sent me my blog via email. I think I just replied that it was really interesting. Then in August 2012 – four months after I started blogging – I was sitting at a funeral in Norman when Superintendent Barresi sat down right beside me. I didn’t introduce myself. By the first Vision 2020 conference, I began to realize that I was making an impact. I overheard SDE employees talking about the blog during one of the general sessions. I also began hearing about the blog from several of my colleagues around the state. Soon, I would see long-time friends posting my blog to Facebook. Social media is the lifeline of this blog, and learning how to use it effectively has been a trial-and-error process. I must be doing something right. Thousands follow the blog’s Twitter and Facebook accounts, and that still blows my mind. I have heard me quoted back to me now more times than I can count. It’s probably the highest form of flattery I can imagine. What do I think the blog has done well? Rob has told me that he owes his blog to me having mine. Similarly, I owe mine to Claudia writing hers. This blog has helped me find my professional (and occasionally unprofessional) voice. It has rekindled my love of writing – something graduate school had killed. When I’m firing on all cylinders, I think I effectively articulate common frustrations. Also, since I used to work at the Office of Accountability (now the Office of Educational Quality and Accountability), I am fairly familiar with some of the more useful sources of data concerning education. I think I do a pretty good job of putting those numbers in perspective for others. I wouldn’t say that I’ve united the #oklaed community, but I have started a lot of important conversations. I’ve been in the middle of some pretty nasty spats too. I’ve enjoyed watching more and more educators start writing themselves. I think they look at mine and think blogging is so easy even a caveman can do it! Collectively, we have turned back a wave of people who seek to destroy our schools. Most Oklahomans support public education. Those who don’t have to manufacture a crisis to chip away at us. I think people understand this better than they did before I started writing. My best posts are well-researched, but some miss the mark. Occasionally, I have taken shots at some of Barresi’s hires, intending to focus on the position and process rather than the person. I have not always effectively made that distinction. One such employee began an email conversation with me last year and explained that to me. It made me feel as if I had become the bully. While I regret nothing I have written about Barresi, I wish I had been more matter-of-fact in discussing some of the SDE employees. None Few of them have ever done anything to me personally. I also hate that my blog became so focused on Barresi, but I don’t know how I could have avoided that. She is the embodiment of the false narrative that Public Education is failing. For four years, she was Oklahoma’s messenger. I have written about the Oklahoman and its obsession with preserving her legacy. I have written about other policy-makers. I have even written about the national parallels to what we’re dealing with here. Mostly, I have written about Barresi, though. Smaller things bother me too. For example, I had several good sources when I wrote in the fall that Barresi’s chief-of-staff Joel Robison had resigned. That turned out not to be true. I respect journalists too much to think that I am one. Someone with training probably would have avoided that mistake. He’s gone now, but I was wrong at the time. Those aren’t the only regrets, but it’s a decent sample. Why reveal my identity now? Honestly, I wanted to open when I spoke to the SBE in June with the same thing I have at the top of this post. I would have loved seeing their reactions. For that matter, I would love seeing the look on many of your faces right now. That would have made everything I said after that pointless though. I never wanted the blog to be about me. It has been a great place to share and discuss ideas. At the same time, I really didn’t want to draw the SDE’s attention to my employer. After everything else, we really didn’t need that extra hassle. We do our jobs and serve our community. We follow the rules. Nonetheless, with Barresi’s reputation as a vindictive leader, I didn’t want to invite her wrath. Ask Rob Miller. Ask any number of employees at the SDE who feel fortunate to still have their jobs. This was a concern of mine until noon on Monday. 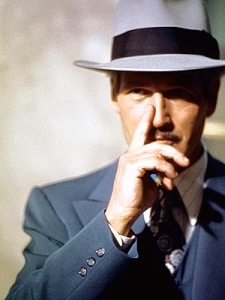 Now that I’m not writing as much and that I don’t worry about retribution, I don’t see the point of staying anonymous. I didn’t want to take any of the attention away from Superintendent Hofmeister this week, so I waited. She was gracious at her reception at the SDE, and she was on point when speaking at the OASA Legislative Conference on Wednesday. On Thursday, coincidentally, she was in Moore to speak to a group of stakeholders from around the state who had come together to discuss high-stakes testing. Revealing my identity before that meeting didn’t seem right either. What I write isn’t that different than what I say or do publicly. I don’t have a separate set of opinions or values for the two separate worlds. I also don’t claim to speak for anyone else. Of everything I’ve ever written, my favorite post was probably I am a Teacher; I Add Value. I wrote that two years ago as Oklahoma was just starting to try to figure out how to measure a teacher’s contribution to each child’s education. I don’t believe you have to measure everything to show that it matters. I also don’t believe you can ever assign a number to a teacher’s effectiveness. I will say that to anyone, anywhere, anytime. In case you’ve missed it, some of the administrators in our district have done a great job of explaining what’s wrong with the quantitative portion of the TLE. I had absolutely nothing to do with the content or the video, which just shows that I don’t have to be the one speaking all the time in order for the message to be heard. Our state leaders are listening – to all of us. I’m no more insightful than anyone else. I just took the time to say what I was thinking. If you think you can make a difference, start your own blog. Just buckle up first. It’s quite a ride. Over the past 20 hours, I’ve said my goodbyes. In Part I, I explained an emerging school funding crisis. In Part II, I discussed Janet Barresi using the state’s editorial pages in her waning weeks in office to play the misunderstood victim. In Part III, I wrote about Barresi’s defenders at the Oklahoman continuing to push a narrative that Oklahoma schools are failing using a metric that shows things got worse under her watch. This, barring something completely unexpected, will be my final discussion of Superintendent Barresi. I’m sure her name will pop up in the future and I will discuss her as an ex-superintendent, but for now, we’re finished with each other. And we’ve had a good run. All told, her new hires total about $653,000 in base salary costs, and the salary increases that accompanied promotions, not counting one executive’s unknown bump in pay, total $62,000. On Monday alone, five new employees with salaries totaling $290,500 were hired. Among them is the executive director of the new Statewide Virtual Charter School Board, with a salary of $90,000. On Wednesday, Michele Sprague was promoted to executive director of literacy and Kayla Hindman was promoted to director of early childhood education and elementary English language arts. Both received $5,000 raises. On Friday, Todd Loftin was promoted to assistant state superintendent for special education services with a salary of $80,000, but officials were unsure how much of a raise that salary amount represented because the decision came so late in the day. I’d say that constitutes a spree. So much for fiscal conservatives, right? Maybe this is an appropriate way for Barresi to leave office. After all, her first days were marred by hires that the attorney general ruled illegal after the State Board of Education rejected them. Congratulations, new people! And enjoy those well-placed targets on your backs! I suppose that’s true. In theory, she could go to work tomorrow and fire and promote more people if she chose to – until 11:59, at least. In related news, tomorrow’s new state superintendent was not impressed. “Instability in any state agency is a hallmark of failed leadership. Future staff decisions will be made with careful consideration and respect for all involved,” she said. “I look forward to joining the State Department of Education next week. I know there are hardworking people in the department and I look forward to getting to know them better. Plans are underway to conduct a formal capacity review of the agency to ensure we have the right people in the right places to best serve our state. 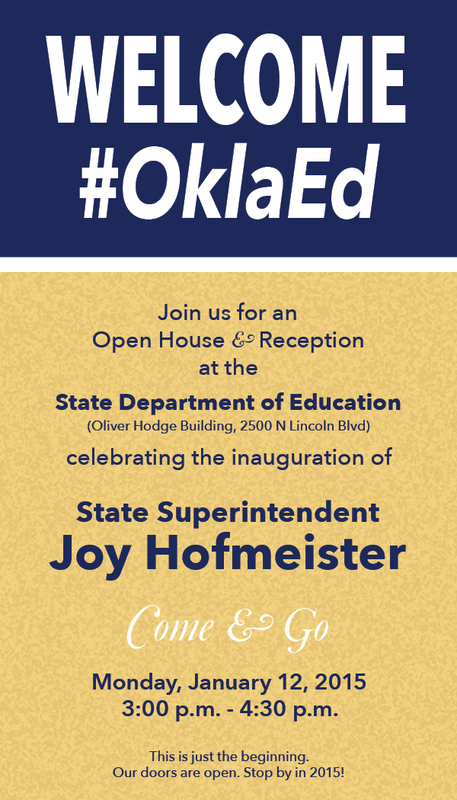 I suppose the easiest thing for Hofmeister to do after her open house tomorrow afternoon would be to go in and click the undo button. In a few cases, I wish that she would. I won’t single anybody out, but several of these are horrible choices. At a minimum, Hofmeister should review all personnel moves that have come in the last 30 days or so. It’s very tempting for me to give a list of people that I think Hofmeister should rid the SDE of as soon as possible. I would assume that of the 10,000 people who answered her survey, many did precisely that. I mentioned specific names of SDE staff whom I find helpful. I mentioned different offices that seemed to be in disarray overall. Still, if Barresi promoted you during the last week of her tenure because you’ve been a stalwart of her administration and a good steward of her vision for public education in this state, there’s a good chance that you’re pretty out of sync with the voters who summarily dismissed her in June. The last week was nothing more than a last-ditch attempt to preserve what she has tried to do – in other words, she’s still trying to tell the voters that they’re wrong. One reason, as Brett Dickerson wrote today, that we shouldn’t get our hopes up for massive changes overnight, is that there is a tremendous amount of damage to undo. At the beginning of her term, Barresi fired most of the people with any institutional knowledge. As a result, school districts and parents could not get quick answers to our important questions. One of Hofmeister’s first tasks will be to re-populate the staff at the SDE with competent, knowledgeable, helpful people. To do this, she will also have to clear some room. It’s going to be bumpy for quite a while. With a new testing company in place, standards to write, TLE to reform, Congressional and Presidential whims to absorb, and ongoing questions about adequacy and equity in school funding in Oklahoma, Hofmeister faces, as Barresi stated in one of her editorials last week, a steep learning curve. The difference this time will be that she’s going to be listening to educators and parents in this state rather than following Florida and Indiana everywhere they go. Just like that, I’m finished writing about Superintendent Janet Costello Barresi. Where has the time gone? When will we see her again? And who really cares? Let’s just move forward, diligently. Monday is a new day for public education, indeed. I should probably clarify that one of the things I’m calling an editorial is actually self-aggrandizing extended interview at her home-away-from home – the Oklahoman – from two weeks ago. Still, it’s pretty much Janet being Janet. This mission sounds so simple, yet it has proven one of the most difficult to accomplish, because everyone has a different idea of the best method to achieve success. I read the whole article through a news digest, and honestly, there isn’t much you’re missing. I still see no evidence that she’s learned anything. To learn, she would have had to attend class and paid attention. Instead, she spent four years insulting the state’s teachers and copying her work off of Jeb Bush. When she says that “everyone has a different idea of the best method to achieve success,” she shows selective memory. It has always been her way or no way. Those who disagree with her (such as the vast majority of the legislature and voters) are simply pathetic and outrageous. But thanks to the vision of Gov. Mary Fallin and state legislative leaders, Oklahoma embarked several years ago on a package of education reforms. The agenda was ambitious — improve school culture, increase academic rigor, tighten accountability, recognize the importance and usefulness of analyzing data — but critical if our youngest generations are to enjoy economic opportunity and the path to happy, successful lives. The A-F Report Card for schools gives parents and communities an easily understood snapshot of how schools are doing in subject areas and various barometers of success. The report cards enable struggling schools to consider best practices of peer schools with similar student demographics. The Reading Sufficiency Act puts long-overdue emphasis on ensuring that children can read at an appropriate level instead of sentencing them to academic failure. The Teacher Leader Effectiveness program helps strengthen teachers and professional development. The Achieving Classroom Excellence (ACE) initiative begun by Gov. Brad Henry makes sure high school graduates understand what they have been taught. Charting a new course is hard. A number of reforms have been controversial and sparked fiery opposition. Given that what’s at stake is the future of the children — and, by extension, the future of Oklahoma — I’d expect nothing less than a tough fight. But turning back now would be a grave disservice to our students, parents and teachers. Sadly, nothing she and Governor Fallin have done improved school culture. They have maintained a consistent focus on the ill-fated pursuit of punitive reforms that punish students, teachers, and schools. Teachers are scared to do what they think is right. Principals worry about their report cards. We’ve allowed politicians who know nothing about education to turn teachers’ lounges into data walls. If we really want to improve our letter grades, we have to focus exclusively on what’s measured. And yes, those reforms go back to Brad Henry. Then again, who co-chaired the ACE taskforce? We’ve created so many loopholes to award diplomas even for students who never achieve a passing score on the state’s End-of-Instruction exams that the students who actually don’t graduate are anomalies – tragic anomalies. The law especially penalizes, predictably, special education students. Maybe our politicians have (state and federal) have intentionally created a public education system that focuses on the wrong things to build momentum for the vouchers they so desperately crave. If parents turn on the schools – through no fault of the teachers – that’s gravy for the voucher crowd, right? As for the fiery opposition, I’m just glad to have done my part. Think about it. I have a (mostly) anonymous blog. As much as I want to pretend differently, I’ve spent an inordinate amount of time in this space opposing Dr. Barresi. While other elected officials and bad writers have had my attention, she has been the root cause of the most damage to public education in our state in the last four years. I have nearly 3,000 followers on Twitter and 2,500 on Facebook. I may have struck a nerve, but she just has made it so dang easy. If I had been retained in third grade emotionally, I might even say, but she started it! I hope the publishers in this state soon realize that the state’s readers don’t care to continue hearing from a failed politician who was rejected by 80 percent of the voters in her own party. For one paper, I doubt there’s much hope. For those of you who aren’t regular readers of The Lost Ogle, you may have missed a story they wrote in November mocking the Oklahoman for pulling together a focus group of technophobes who love their editorial page. That’s the target audience in central Oklahoma, I guess. That will be my focus of Part III later today. As you might recall, I emailed you after the Dec. 18 Oklahoma State Board of Education meeting to let you know about a change in the method of calculation of the mid-year adjustment. At that time, we had not received the information our agency needed from the state Tax Commission to begin our mid-year adjustment calculation that would be aligned with the 1992 law. I wanted to follow up and let you know the current situation regarding the mid-year adjustment and what you can expect moving forward. As I stated in the earlier email, the change you will see in the calculation is that commercial and agricultural personal property taxes will be capped at 11 percent. In past years that cap has not been utilized. Nevertheless, a statute effective in 1992 requires the cap to be placed on those elements of local ad valorem used as a chargeable in the state aid calculation. My office became aware of this fact this past August. I moved quickly to correct the issue. We received the majority of the information needed from the Tax Commission late last week. Some information discrepancies still need to be worked out, but State Department of Education staffers are working hard and will continue to do so this weekend. Every effort is being made to complete mid-year calculations by our statutory deadline of Jan. 15. The payment scheduled to be made to schools on Jan. 15 will be made. The payment will either be based upon the new mid-year allocation or your current allocation if we do not have sufficient time to complete the adjustment. Any differences in the current and mid-year allocation will be made up during the remainder of the fiscal year. While I understand this will be a significant burden to districts, I wanted to get this information to you as quickly as possible to facilitate planning and your communication with your boards and constituents. As you know, the accuracy of these calculations is of paramount importance. In other words, you’ll either get the correct amount on Monday, when the new state superintendent takes office, or you won’t. You’ll get something, and then maybe it’ll be corrected later. That’s a nice last missive, and a funny position from a state superintendent who has repeatedly threatened to withhold funds from districts that failed to meet statutory reporting deadlines…but I digress. As many of us have suspected, the SDE Finance Office is limited to the information the Oklahoma Tax Commission provides them. It is the fault of no one at the SDE – past or present – that this 22 year mistake hasn’t been corrected until now. Last month, the Oklahoman wondered aloud why nobody was blaming the administration prior to Barresi’s. Ballard has routinely lambasted Baressi, a Republican, for education woes in this state. He has every right to do so. But it’s notable that he declined to aim similar venom at Sandy Garrett, the Democrat who was state superintendent from 1991 to 2011. She was in charge when the allocation changes were implemented. 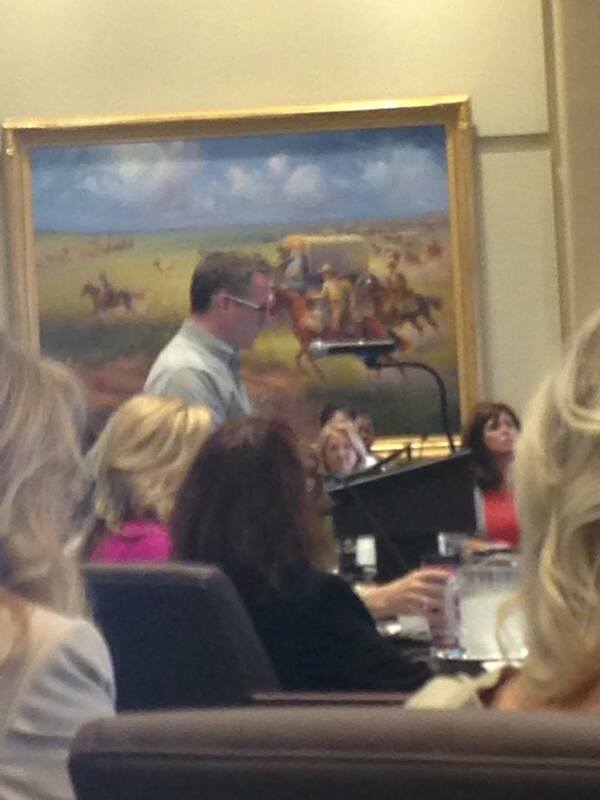 Shawn Hime, executive director of the Oklahoma State School Boards Association, is also notably reticent. Hime was an assistant state superintendent for Garrett from 2004 to 2008, around the time Pennington says agency officials ignored him. Hime’s bio says he “provided oversight of allocations and payments of the state’s $2 billion education budget,” suggesting that he played a direct role in supervising the funding formula. The problem seems to be with the information provided to the SDE. They don’t collect the revenue; they merely run numbers through the funding formula. They work with what they have. As I’ve previously stated, I’m less concerned with what happens this year than with what happens when a district (or districts) that has been on the short end of the funding mistake for 22 years sues. If they receive a favorable ruling, and districts that have been overpaid are then docked future aid payments, the outcome could be devastating. Nonetheless, a school board would not adequately be representing its community if it did not pursue the funding it had been shorted. This is going to be messy. In her four years in office, Barresi has sent out some wacky emails. She’s even investigated the emails of others. After all that we’ve been through together, I was expecting a bigger bombshell in her last direct message to schools. I guess she was saving, as Rob put it, that one last turd, for her usual litterbox, the Oklahoman. What you’re smelling right now is a breath of fresh air. It’s crisp and full of hope. It’s right around the corner. Still, I’m looking forward to day one. We’ve waited four long years for this. Breathe in. Breathe out. If it’s Monday morning, then it’s January 5th. We have things to do, people. Put away your snowmen. Quit crushing candy. It’s time to get back to work. Here’s in an overview of some tasks administrators will need to complete this month (with special appreciation to the Regional Accreditation Officers who prepare the monthly lists for us. Remember, S is for state; F is for federal (as if we need reminding of that). S Parents with an approved Open transfer must notify the Receiving District by August 1, in writing, if they still intend for their child to enroll there as a transfer student in Fall 2015; Accreditation/Transfers (405) 521-3333. S Oklahoma Teacher of the Year (TOY) award application for 2014-15 is available; SDE Events office; SDE Customer Service (405) 521-3301. 9 S OPAT Data Report is due; Special Education Services (405) 522-4513. 27 F Computer-generated school district Expenditure Reports are due; Federal Programs (405) 521-2846; School Support/School Improvement (405) 522-3395.